Have a few things hanging around after your holiday baking? Chocolate wafers? Maybe a few sprinkles? Some Skor bits, mini chocolate toppings? Nuts? No need to let them go to waste! 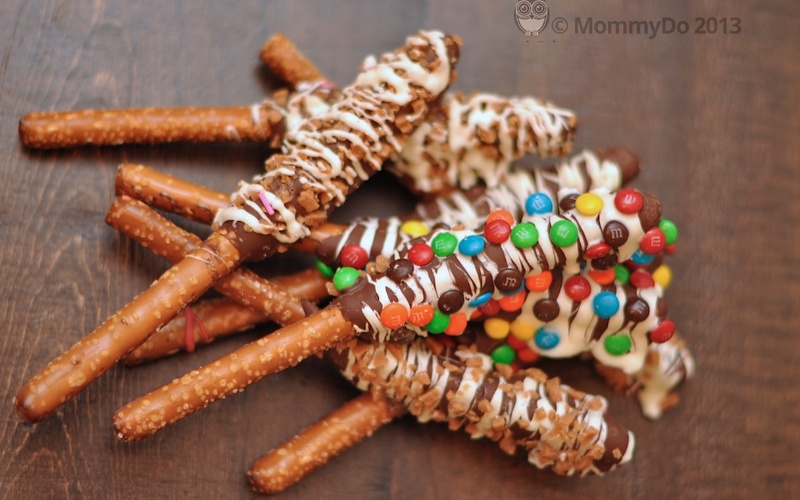 These dipped Mommydo Holiday Hang Over Pretzel Sticks are a fabulous way to use up some of the odds and ends left over from the holiday baking frenzy. They take practically no time. And, your friends and co-workers have had just about enough of their New Years resolutions at this point and will be only too happy to take a few off your hands. Whatever little bits you have hanging around that you can use for toppings. Prepare a baking sheet or two with parchment paper. Melt chocolate in the micro at 30sec intervals, stirring between until all the chocolate is melted. Dip 3/4 of the stick into the chocolate and slowly spin the stick to allow as much chocolate as possible to adhere to the stick. Place the stick on the parchment. If you are adding a second kind of chocolate, now’s the time to melt that. To drizzle the chocolate, use a fork. Gently swing the fork back and forth over the area you want to cover. I did 2 or three sticks then topped them with extra chocolate and toppings. Then dipped two or three more and topped those. Be sure to place them about an inch or more apart on the parchment as the chocolate will spread. You might want to put then into the fridge to allow them to harden. You can do nuts, but as I was feeding these to the boy, I kept them nut free. Store in an airtight container to keep the pretzels fresh. Sucha a fun and yummy treat!